Narrow Mallet with 18mm heads. This mallet has faces of 18mm diameter - it total weight is 90g - the handle is wooden and is 220mm in length. It has a soft and hard rubber ends. The ends are able to be unscrewed and replaced. This mallet is an inexpensive soft headed mallet. It can be used for fret installation and its and its narrow width means its can get between the high frets. It is very light weight allowing many little taps to be applied with ease. Our sales over several years of the bigger version of this (weighing 600g - also built by AmTech) for fretwork make us confident in recommending this general purpose soft headed mallet for light use in fretwork. The heads - one soft and one hard- are really useful so you can go gently to start with the soft head and then issue a few well positioned strikes to make sure the fret is fully driven into the slot - with the hard head. If you are occasionally installing a few frets, for example doing a partial refret of the low frets, then this mallet offers an inexpensive tool which has a proven track record for this work. If you are re-fretting whole fretboards every day then our professional fretting hammer will be more suitable. 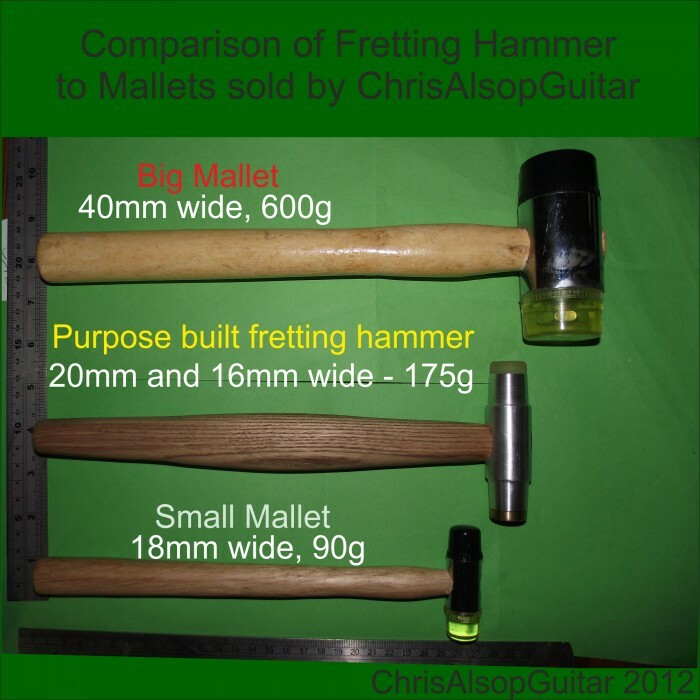 To help decide the best fretting hammer (made in house by Chris Alsop) or mallet (panel mallet made by "AmTech" - proven OK for fretwork) for your fretwork a picture is included showing all three that we sell together. FretBoard Protector. Choose from 16mm, 20mm or 40mm wide with 2.3 or 3.1 slot Slot Width ..